New research suggests that standing desks, which allow employees to alter their position during the day, may boost performance at work. A number of NHS staff were given new desks and set goals for standing time. After a year, researchers found sitting time was reduced by more than an hour a day compared with their colleagues. Employees who reduced time sitting, by using desks that also allowed them to work while on their feet, also said they were less tired and more engaged. Could offices change from sitting to standing? The research team, led by experts from Leicester, assessed 146 mainly sedentary NHS staff. 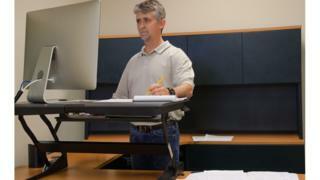 Seventy-seven were put in an intervention group and given height-adjustable workstations – also known as sit-stand desks – while the remaining 69 continued with their standard desks. Working time spent sitting was measured at the start of the study and again three, six and 12 months later. At the start of the study, overall sitting time was 9.7 hours per day. Over the course of the experiment, sitting time was lower by 50.62 minutes per day at three months, 64.4 minutes per day at six months, and 82.39 minutes per day at 12 months. Those who were given sit-stand desks also reported improvements in musculoskeletal problems, according to the research published in the British Medical Journal (BMJ). A questionnaire filled out by the participants also suggested employees who used the sit-stand desks were less anxious and cited an improved quality of life – but no notable changes were found for job satisfaction, cognitive function or sickness absence. Medical research has suggested constant sitting is harming our health – potentially causing cardiovascular problems or vulnerability to diabetes. A survey by the British Heart Foundation in 2015 found that the average person sat for almost all of the nine hours spent in the office. But it’s not the case everywhere. In Sweden, sit-stand working is commonplace – and in 2014, Denmark made it mandatory for employers to offer their staff sit-stand desks. However, the authors of the report say more research is needed to gauge the longer-term benefits.